Park Slope's Trinity Grace Church recently joined S.O.S. in celebrating S.O.S. 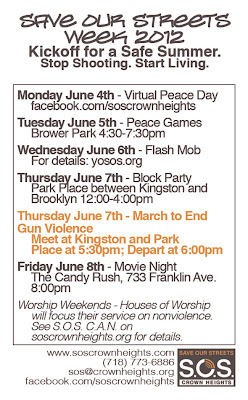 Week and Nonviolence Worship Weekend. 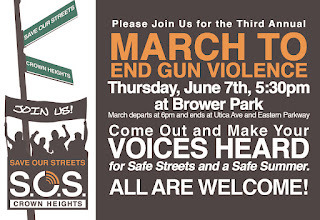 The church's Crown Heights Missional Community group, which seeks opportunities to serve and engage with other Crown Heights residents, participated in the March to End Gun Violence earlier this month. During Trinity Grace's June 10 service, James Cernero, the group's leader, spoke about the work of S.O.S. and led the congregation in a prayer for S.O.S. 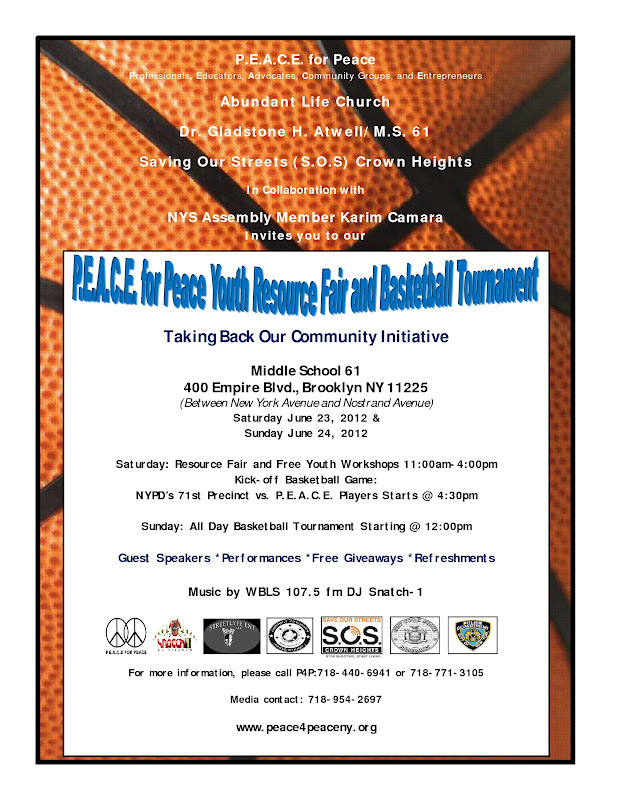 workers and high-risk youth, as well as peace in the community. Thank you to the over 600 people who participated in Save Our Streets Week, and to the staff and volunteers who made it possible. 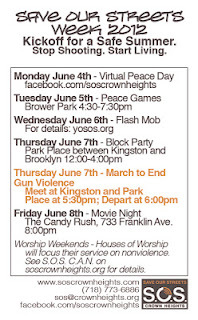 In spite of the rain, young men and women from the neighborhood gathered in Brower Park on Tuesday June 5th for S.O.S. Peace Games. While those that were participating in the Basketball tournament waited for the court to be cleared, young kids played egg and spoon races, and cheered the players on. 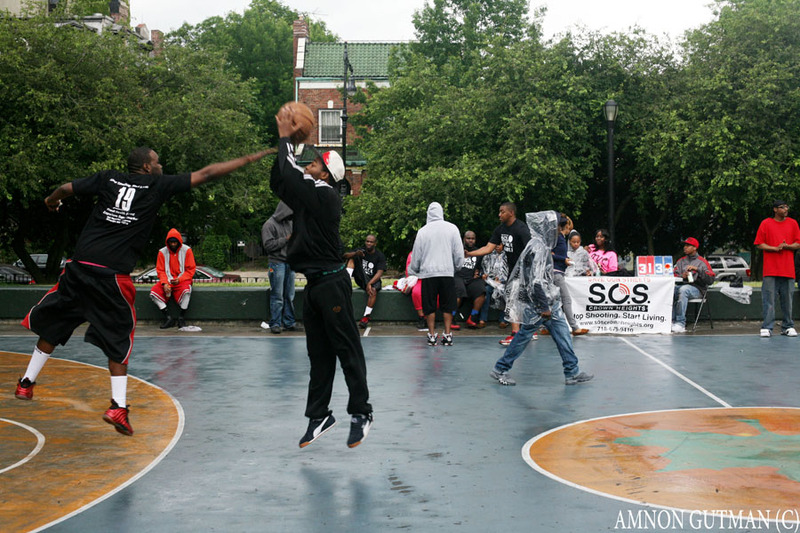 The game was rescheduled to Friday, when over 150 people returned to play again. 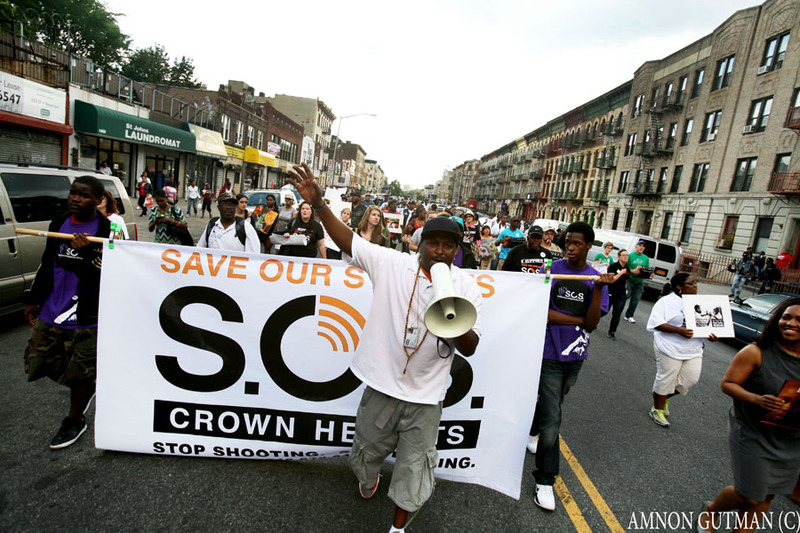 On Wednesday, June 6th, the youth organizers of Youth Organizing to Save Our Streets surprised Crown Heights with a flash mob. 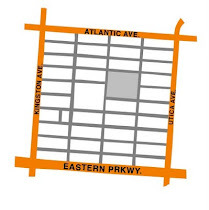 At exactly 6:00 PM, two young people staged an argument on the sidewalk of Utica Avenue. Onlookers were concerned and Outreach Worker David Bookhart was about to mediate. The block party and March to End Gun Violence was on Thursday, June 7th when school was out for Brooklyn Queens day. 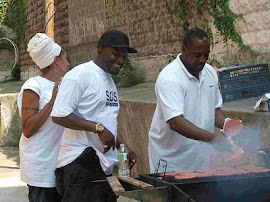 The day began with a barbecue on Park Place in front of Brower Park. S.O.S. Volunteer JC Carter aka DJ Spinrite spun some tunes that included a special S.O.S. 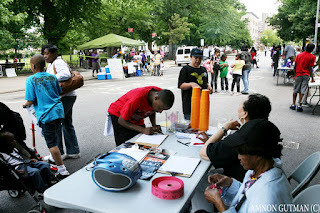 mix, residents visited resource tables, and kids enjoyed games, a special art activity from the Brooklyn Hi Art! Machine, and even got to play with reptiles from the Brooklyn Children’s Museum. 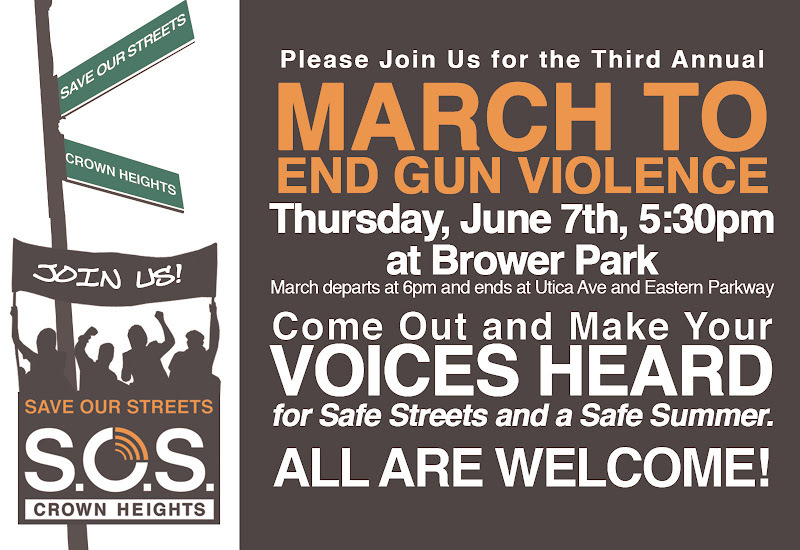 In the evening, residents gathered in Brower Park and began to march through the neighborhood. Over a hundred people chanted in unison “Peace Up, Guns Down” and “You Watch My Block, I’ll Watch Yours; Your Watch My Child, I’ll Watch Yours. Along the way, children and residents were waiting to support the marchers with signs that encouraged an end to gun violence. 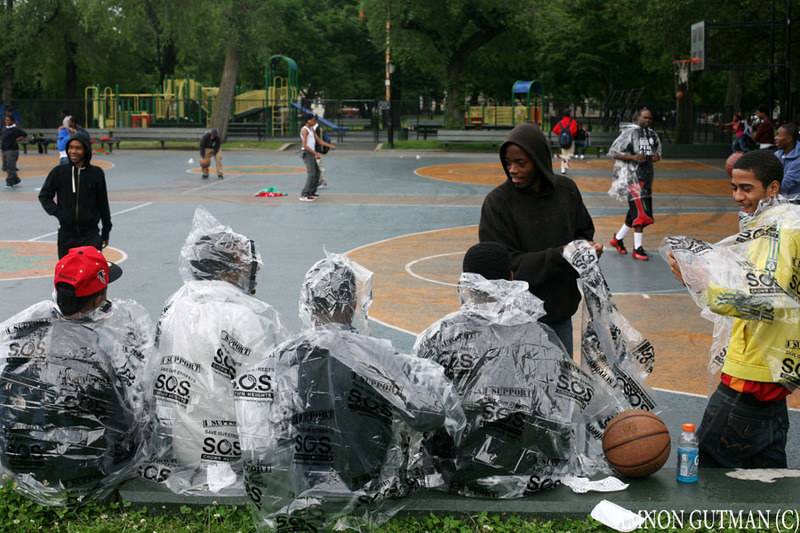 After arriving at Utica and Eastern Parkway, S.O.S. 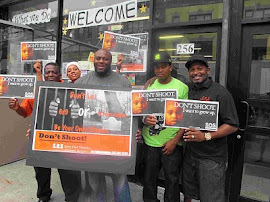 staff led a ceremony to remember the victims of gun violence, to identify the costs of gun violence to the community, to recognize what the neighborhood as accomplished in the last year, and to commit to taking action to reduce gun violence even further in the year to come. S.O.S. 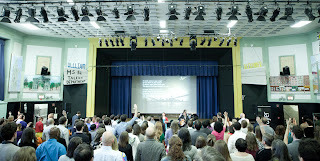 is excited to have kicked off the summer with so much energy, commitment, and support. Please visit our facebook page to see more pictures from the weeks events. The Shannon T. Braithwaite Foundation, which provides resources and support for young people ages 13-19, will hold a fundraising talent show on Saturday, June 9, from 6-9 p.m. at 790 E. New York Ave.
After losing her 16-year-old daughter, Shannon, to teenage violence in 2008, Marva Braithwaite became involved in community violence prevention work in schools and community institutions like the Brooklyn Children’s Museum. 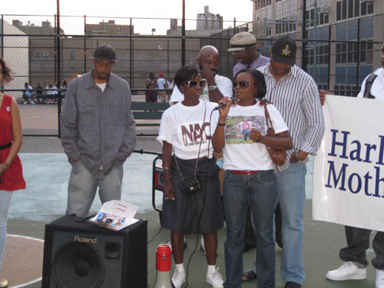 Soon, she realized the pressing need for clean and safe environments for children and teenagers and was inspired to start the Foundation in January 2012. Today, the Foundation provides tutoring, mentoring, athletic and dance opportunities, educational trips, and PSAT/SAT preparation for more than 40 teens, all of whom applied for the program and are required to turn in regular report cards. Ms. Braithwaite seeks to offer well-rounded assistance to the young people the Foundation serves. By meeting their mental, emotional, and physical needs, she hopes to help them overcome the anger many of them name as their “biggest issue” so they can identify who they are, find purpose in life, and prepare for their futures. The talent show will feature teenagers from the Foundation’s program, as well as other local teens who support its mission.